Designing a starship that suits you, your gamers and your games. Interstellar sci-fi games often revolve around one thing: starships. Many players of these types of games become quite passionate about starship design and starship capabilities and this can create various game related problems. Also, while most sci-fi roleplaying games have their own systems for starship design and implementation, the following tips might help further flesh out your game's starships and give them some added character. Players of the game, both GMs and attendees alike, love to tinker, modify, and list the abilities of their starships. The great space-battle type games cry out for such designs and players will want to ensure that if they get into any trouble they have the vessel to do the job. This can lead to all kinds of designs, even down to the smallest items, systems, and capabilities that the designer can squeeze in to cater for every eventuality. This is all fair and good--nothing brings a more genuine smile than when the starship successfully does something it was designed to do. To make your job of campaign preparation easier, try to harness the enthusiasm and passion the players have for starship design and let them tackle as much of this game aspect as possible. This will include players at a higher level of game involvement and will greatly increase their campaign satisfaction. Player driven, detailed ship design can make things a little problematic for the GM. If the ship has a system or gadget for every eventuality, then the game is going to be a little predictable and adventure challenges too easily solved. The GM should ensure that he/she isn't giving into Player Pressure or the Cool Factor and that the design of the ship suits the game. 'Player Pressure' is when the players either continually badger the GM to allow them just 'one more addition' to the ship, or they gang up on the GM with tables of rules, costs, and dice rolls to get their own way. Don't fall for it! If you cave in and allow the modifications, then the players will think they can always get away with it and maybe with other rulings as well. If they want a great ship part make them work for it. A high price, lack of availability, or even a series of adventures earning the right to have the part will make them think twice before pressuring you again. 'Cool Factor' is the GM falling into the trap where they themselves think that the fast, sleek, manoeuvrable ship is a good idea and allows the modifications, but then regrets their decision later on. When the players get into trouble they easily get out of it, not once but many times, until the encounters become repetitive and predictable. It's easy to get caught up in the Cool Factor trap, but if you refrain from going overboard in your design then you'll appreciate the vessel later on in the game. It can make for a good game when the players get protective about their ship, even if it is a dilapidated old freighter, and it gives the vessel more character. What the vessel is designed for will decide many other factors of the design process. A simple hired transport will not be large and will have a limited crew and cargo capacity. A destroyer could be huge, with space for war machines and troops, serving a crew of hundreds. A survey vessel might be large and have a crew of varying scientific skills and abilities. Deciding what a vessel was originally built to do gives a sense of purpose and ability. Vessel size will determine the crew complement and capability and will influence many ship systems. A small freighter might have half a dozen crew with several different responsibilities divided between them. A great liner-type ship will have a crew of dozens, even hundreds, with whole teams of people dedicated to a single ship's operation, such as the engineering crew or attendees. Size will also help determine where the ship can and cannot go. A smaller vessel could dock with a space station and land on a planet while a larger vessel might have to park next to a station or planet and ferry crew across in shuttles. A small ship will be able to manoeuvre through an asteroid belt whereas a larger ship might be a sitting duck. Size can also be an indicator of strength. A small ship might take two hits and be destroyed whereas a larger vessel might need to be hit a hundred times before the damage is regarded as severe. The command area of the vessel is the nerve centre of the whole construction. As in the TV/Movie series Star Trek, the bridge is the single most important part of the starship, so you'll have to design what's required in the cockpit/on the bridge. If it's a small trading vessel, it might just be a pilot and co-pilot taking care of business. A huge exploratory ship might have a dozen or more workstations scattered about the bridge with several personnel on duty taking care of tactical, navigation, or sensors. Consider also, how much control does the bridge have over the rest of the vessel? Decide what systems tie directly into the bridge/cockpit and what systems will have to be travelled to directly to operate or influence. a) What is the vessel's power source? b) How dangerous is it? Perhaps it's a new form of clean fusion that presents very little danger, or maybe it's concentrated fusion that emits high levels of radiation that need to be heavily shielded to protect the crew. a) What would happen to the ship if the core shut down? b) What would happen if it leaked or got damaged? Power is a requirement on starships, but the dangers of harnessing that power should be considered. Crew requirements need to be taken into consideration. Mainly, these requirements are the simple things in life, that of air to breath and an acceptable temperature to survive in. Gravity is also a necessity on long voyages to avoid muscle and bone degradation but may not be possible in your game's setting. Either way, the life support system will need to be considered to keep the crew alive. Depending on the setting and on what species of crew you have on board, the life support ability may vary from one section of the ship to another. It's all fair and good taking on alien passengers, but if your atmosphere is lethal to them it's not going to be a very long stay. It's all very well going off on deep space adventures, but it makes things difficult when you don't know what's around you or not being able to let other people know what's going on. Sensors come in varying packages. Either they have a long range and give you full details of what's around you, or they have a limited range and simply pre-warn you of any approaching objects. The sensor ability will depend on the vessel's purpose. A warship will have multiple sensors that will identify threats and targets, with tactical details of the targets being presented to the viewer. Research vessels may have a broad spectrum of sensors that may be able to track and probe life forms, minerals and atmospheres. A smaller vessel may have a simple proximity-warning sensor that bleeps when something comes too close. Communications may vary also, depending on the technology level you're gaming in. The signals sent by a starship may take weeks to get to their intended target, meaning the vessel really is alone in space. Alternately, the signal might get to the target instantaneously, using subspace/light speed technology to relay the message. Communications will help determine risk. If the players get into a dangerous situation and a distress call will take two weeks to reach a friendly location, is it worth it? a) Sublight speed, which determines how fast a vessel can cover distances between planets within a solar system. b) Supralight speed, which, if the vessel is capable of such a thing, determines how fast a vessel can travel between solar systems. Sublight can take the form of thousands, even millions, of kilometres per hour depending on the capability of the ship. Smaller ships may get to certain places faster but have a limited fuel supply whereas larger vessels may have a longer range and a huge supply of energy to burn up. Supralight is the speed that enables the vessel to get between stars. This can be any speed the GM wants, with a drive that enables the vessel to get to a star in weeks, or a drive that might enable the journey to be completed in days or even hours. There are also drives that could enable a vessel to instantly appear within a solar system, taking no time at all. It depends on the GM and what he/she thinks will work for their game. Long voyages can be adventures in themselves. The crew can breathe and walk about your ship, but what do they eat? Where do they sleep? Is there anything for the crew to do to relax? Long journeys can be tiring, especially cooped up in a vessel, so the crew will want to be able to relax between shifts, especially if it's a large crew on a large ship. A small ship may have a few music/video programs or games to keep the players entertained (like the holochess board on the Millennium Falcon in the original Star Wars movie), or entire decks may be put aside for rest and relaxation on larger vessels (as in the holodecks in the Star Trek TV/movie series). Food is a concern, especially if more than one species is working on the ship. Does the vessel have a galley or do the crew quarters each have their own kitchen/dispenser? What do they eat? Concentrated food, tablets, or full meals from a stocked kitchen? When resupplying at a station you can top up fuel or get repairs, but food is also a necessity. Also decide how and where the crew has downtime for sleep and personal chores. They may all share dormitories, have their own quarters, or share with one or two other people. They may even be jammed in like sardines, like on a submarine. Getting on and off the vessel is important in both duty and emergency. Duty involves the normal boarding/disembarking from a starship in various ways. Perhaps the crew is shuttled in on smaller vessels that are permanently stationed in a hanger in the starship on large vessels. Shuttles and landing craft may be used to get to and from planets and stations, but perhaps the crew is 'beamed' to their destination by matter transporters instead. What about an emergency? Does the vessel have enough lifepods or lifeboats to get everyone off? How long would it take? Smaller vessels may have one or two lifepods to cover the crew, whereas bigger vessels may utilise lifeboats so large that they are small starships in themselves. Decide on entry and exit points on your starship and what they are used for. So, the ship is flying about the cosmos when - gasp! - Pirates/Enemy Ships/unsociable aliens suddenly attack it. So, what is the starship you have designed capable of in a fight, and how well protected is it under fire? Offensive weaponry can come in many forms, as in missiles and lasers, but what does your ship have to offer? Again, this goes back to the purpose of the vessel. Warships may be bristling with gun emplacements and torpedo tubes, a research ship may have a few weapons for defensive purposes, and a smaller trading vessel or a fighter may have one or two weapons suited to the kind of enemy it may encounter. What can a ship do to protect itself? Does it have armour plating? Energy shields to block shots? Perhaps it can launch countermeasures to confuse targeting computers and missile guidance systems? It sometimes pays to think beyond what damage a ship can do and consider what damage a ship can take. To give the vessel some character, consider what other adventures and missions the vessel has been involved with before it appeared in your game. If the ship is brand new then this is not a consideration and the game itself will determine the ship's story. Older vessels, either second-hand ones or ships the PCs have been stationed to, may have a long history however. Has there been many previous owners? What adventures has the original crew had in the ship? The age and any modifications done to the ship since its launch date might be worth looking at as well. An old, dilapidated warship may be no match for a modern battleship, like matching a World War One frigate against a modern day aircraft carrier or destroyer. But the age of the ship, and what it's been involved in, makes for great character. If you give it the same kind of character history as you do for NPCs and PCs the ship takes on a life of its own. Visual design can certainly vary, but take one thing into consideration - aerodynamics is not a problem! The vacuum of space means no friction, meaning any ship of any shape, no matter how outlandish, can travel the stars. Visuals can be determined by yourself (if you have artistic tendencies) or pictures can be utilised out of most science fiction books and even space science websites, such as www.nasa.com. Again, that's GM discretion. If you want to take a jumbo jet, knock off the wings, and slap a great big cannon on top of it, then there's a spaceship straight away. Before I go any further, can I please thank Andrew Curtis, a regular player of my games, for the title of this article. We were sat in my living room on Monday 25th of June, 2001, about to start a roleplaying session (set in the universe of Buffy and Angel) and we were discussing where the characters were going to go from here. I said I had a few things designed when Andrew suddenly said, ‘whatever happens your games are usually wing and milk, anyway’. I looked at him quizzically. We laughed. ‘Top line’, I said. ‘I’ll have to write an article on that’. There are plenty of articles already that concern preparation, design, ideas and atmosphere. They detail advice on how to get a game together and how to run it. Because there are a few things to consider before running a game the articles detailed most things you can do and, therefore, were quite long. That, in turn, might mean a lot of work. But what if you simply don’t have the time to spend designing and preparing a game? You might have a busy work or social schedule, might be running more than one session for more than one group and can’t afford the energy and effort. What if you don’t want to prepare in detail? Hey, you might be laid back or easy-going and think ‘the hell with it, we’ll just see how the game goes’. If this is the case, then ignore the other articles. They won’t help you now. What you want to do is get down to it, get the game on and just let roleplaying nature take its course. Isn’t this lazy? Hell, yes! This will mean les work in preparation – unfortunately, it will mean more work when the game is actually running. Not really, no. Just take a location you know or have seen and just change it. If the players go to a busy shopping station then take your local shopping centre or mall and jazz it up. Escalators become anti-gravity tubes, computer game shops become speeder showrooms, and clothes shops become multi-species clothing specialists. People don’t walk about; they zip along on rolling conveyor walks, or fly about with personal anti-gravity chairs. What’s more, you don’t even have to take the effort to describe in detail what the place is like – tell your players what location you’re basing it on. The same goes with a city. Take New York, slap a few starships overhead and roads between the buildings and what do you get? A city suited for gaming. Need a small town? Grab a town local to you and stick a crashed starship in the middle, remove the second stories of all the buildings and replace them with glass domes and there you go – instant location. All you have to do is ignore real world references. So, you’ve got the location, now for the people who will be there. I’m not even going to insult you GM’s out there by detailing how to do it, so I’ll just make it simple – what do you think character templates are for? Need an NPC who might need to make some rolls? Is he/she a smuggler? Take the template and there you go – instant stats. Need a bounty hunter? Same thing. Need a professional? Normal stats and then the extra dice for their profession – done. As in the ‘Ping! What A Great Idea’ article in this book you can refresh games by taking ideas and plot threads from popular media. But, in this case to minimise work, you actually take the story and re-create it in your setting. All you have to do is change a couple of the plot threads (like who it was who actually committed the murder, or stole the jewel, or whatever the program deals with) and just change it all for your game. Fair enough, the players may have seen the same program but when you do introduce that plot change they won’t be able to second-guess you. Word of warning, though; don’t re-create the program scene-for-scene, changing the New York Cop for a Security Bureau agent or a London taxi driver for Starship taxi pilot. That would be dull. All you need is the elements of the story. Is this theft of other people’s ideas? Hell, yes! But you’re not making money out of it and it’s for personal not public use, so it’s legal. I think. Let’s face it – there’s not much to this article, is there? All I’ve done is make you all very lazy creators and GM’s, relaxing in front of the TV an hour before the game, looking at stuff in your room and twisting the words and thinking of someplace you’ve been to or know of and adding a couple of aliens. It’ll be game time soon but you’ll just take another sip of your drink, shrug, and say ‘I’m ready’. One of the worst things about being the all-powerful GM in a roleplaying game is looking across the gaming table and staring into the eyes of someone who just died. Not you’re friend actually keeling over at the table, of course, but the player’s character in question. After many games, actually biting the big one after being shot/ stabbed/ blown up/ dissolved/ vaporised/ minced/ spaced/ gassed/ strangled/ beaten/ sliced/ diced/ pushed/ made very depressed and left with only one drastic, stupid option. The character is, to be blunt, dead. Oh, dear. There is never a worse time in a game as when a carefully designed player character actually makes one too many mistakes, or one too many low dice rolls, to be allowed to survive. There are many things that you have to consider before, during and after a character being killed. BE SURE THAT THE GAME YOU HAVE CREATED ISN’T A SIMPLE DEATH TRAP. Oh, please. We’ve all sat down and designed the ‘mother of all deadly locations’ with pitfalls and lasernets and security systems to die for. Literally. What you’ve got to realise is that the players won’t take the risk if they think that it’s simply too difficult and then all your evil work has gone to waste. But what do you care, right? You can’t hold the player’s hand through a scenario, all you’re doing is presenting the material and it’s up to the player to get through it. Hey, if they get vaped that’s their own fault, right? It’s very true that you can’t direct the player on the path to success. It’s also true that part of the game is the fact that they are taking risks and giving them the obvious way out of every situation is a no-no because it destroys the illusion of risk. You don’t want the players to walk away from a situation where they were blatantly doing things that were so dangerous, so reckless, that the chances of getting killed were high. You don’t want to tell them ‘Are you sure you want to do that?’ continuously because that makes them far too wary and not only makes them a lot more cautious, which slows the game down, but it also virtually guarantees them survival. What you want to do is allude to the fact that it is a dangerous situation. If the player is still on a road to destruction then quickly throw in a reminder of their predicament. If they continue then it’s the final jump for them if they fail. At least you can’t be held responsible for the death of the character. Don’t remind them all the time, just when the encounter begins and maybe a quick mention at variable points. Also, the biggest no-no, is when the player states their actions and you have to make the response. Don’t look at them with a smile and an evil twinkle in your eye and say ‘Are you sure that’s what you want to do?’ What an evil, egotistical thing to do! If the character does die then the player is going to think it was pre-ordained by the GM. Oh, that’ll bring them back for more. No, I don't mean blow them up (unless it's called for), I mean make sure that their deaths mean something. Make sure, after twenty games battling the evil enemy, after saving worlds and thwarting plots and being generally pleasant, that they don't simply die in a corridor after getting blasted by a lucky shot. (b) Faster than light travel, lasers and magic. Oh, please. If you wanted real life you'd go to the shops or something and then get skill points. 'Oh, that's a high skill in grass cutting, now...' Get the point? When a roleplaying character makes a last gasp you've got to make sure it means something. Maybe they get to pilot a starship into a marauding warship to save a planet - fair enough, the character may not have survived a hit but you can just say - 'look, you've got a few rounds to live, what do you want to do?' Then that'll give them time to throw defiance at their enemy, gasp their last, poignant words or save a life. Of course, knowing that they're going to die, some players might take the mickey and say 'I'll shoot the other player characters' or 'I'll tapdance and shout “don't fight, dance”!' At this point you should just say 'too late, you're dead.' If they're going to mess about with what should be a dramatic moment then they probably won't have minded simply dying, anyway. Character death can be annoying - it can be a little upsetting to the player if the character is a well-cultivated one - but it should never be trivial. After the game there should be a few moments to reflect on the character and whatever they attained in their career. Remind the player what they played and why so that they will try to emulate or rekindle what they lost. Players should be able to create their next character with the knowledge that they will get a fair deal at a game and that they can create a personality that will have a beginning and an end. It all makes good roleplaying. Have you ever had those times when, during a game, you just want to go mad because of what your players are doing? PLAYER 1 : I’m not going in there. I’ve been in enough crashed spaceships to know there’s always something dangerous going on. PLAYER 2 : I’m not interested in the ship. I just want to steal the fuel cells from it and get out of here. PLAYER 3 : Let’s just blow it up! GM : But what about the distress signal from the dignitary you picked up from the vessel? PLAYER 3 : It’s a decoy. I bet it’s a trap! PLAYER 2 : Yeah, we’ve been playing these characters too long to let them get nailed now. GM : But... (gets exasperated) What else is there to do? PLAYER 3 : I’ve got some explosives here! Three placements should do it! PLAYER 1: It’s got nothing to do with us, anyway. We’re just on this planet for some R and R.
PLAYER 2 : I’ve been playing this mercenary for weeks now. I don’t want her getting killed over something that has nothing to do with her. GM : (Head starts to swell) But... but I spent ages designing this game! How can you just throw it away on a whim? PLAYER 1 : You show me the money, I’ll show you the heroism. PLAYER 2 : I’m not going to get embroiled in something that has nothing to do with my character. PLAYER 2 : What a drama queen. Are more concerned about their characters welfare than they are with the game. It’s important to keep cool during gaming sessions and try to emanate an air of indifference with what the players are doing. You should get dramatic at certain points to try and get across the situation you are emulating, of course, in the form of NPC characterisation and fast, action-orientated narrative but that goes as read. What you have to do is try to appear unfazed by the PC decisions. If you put on a face at a certain juncture when the players have decided to go down a completely different route then two things will happen. Firstly, the players will continue down that route because they see that you haven’t allowed for it, and the more safety-conscious players will go down that path because they stand a better chance of survival. Secondly, they’ll lose that sense of free will. They’ve obviously made the wrong choice of direction and seeing that the GM isn’t prepared for this will make them think that if they did take the path shown to them then they’ve been railroaded into it. The prime enjoyment of play is thinking that you’re playing in a world where anything is possible and being expected to travel down the road shown is a little linear. Losing control of yourself is disastrous. If you get irate, angry, frustrated, annoyed - basically, if you get emotional about what the players are doing out of the context of the game – then that will obviously reduce the players enjoyment. Watching you pull faces, clench your fist, mutter under your breath about ‘damnable players’ and basically lose your edge will more or less stop the game dead and also lessen the tone of future games as the players wait for the carrot on the stick and your angry reactions to their decisions. So let’s address each of the major game problems one by one. It can be annoying when the players turn left instead of right. What you’ve got to remember is that designing a game that basically signposts the players through an adventure (as is the case with many published adventures) can be dangerous to the atmosphere. Many players, especially those with long experience and well-played characters, will not respond as eagerly to the next step of a scenario as they used to. They’ll be more willing to go off on their own and try to get what they can from the game. This is one of the problems with creating a setting with depth that the players have interacted with for a long time. They’ll take their time recruiting old NPC’s they met, or travelling to far-off locations to get items they might need for the adventure. A scenario designed for a few hours can suddenly double in length. It’s quite simple. You can’t just say ‘you can’t do that’ or simply say that the starship has broken down for the umpteenth time to keep the players in one place. All you have to do is make sure that the situation is urgent, and flying about the galaxy getting help or advice will reduce their chances of getting the job done. You could run a couple of games where the players do go for help, and when they get back it’s too late; the bad guy has had time to fortify defences or carry out their nefarious scheme. Or they could get back and the difficulty of the game has increased over the time they’ve been away. As a drastic measure, any NPC’s they recruited could get seriously hurt, even killed, over what the players had planned. This will make them wary next time they decide to drag someone or something else in to help them. Don’t get annoyed. It won’t be the fact that they’ll feel that their path has been predestined, it’ll be because they’ll think you’re being childish with them and that runs the risk of stopping the games altogether. You’ve spent ages designing and drawing and speculating, and when it comes down to it, the players are just flicking paper at each other and making jokes. First, make sure it’s not something you’ve done wrong. Could the game be unoriginal, repetitive or just plain boring? Take a long hard look at what you are doing and be honest with yourself; would you play the game you’ve designed? There are other articles in this book about games becoming dull and a little stagnant, so take a look at them to see if you can change that. Secondly, simply make a note of what players are enjoying it and concentrate on them. The players who are ruining it will either get bored or leave you to it, or they’ll try to take a little more interest and get involved again. Losing your temper over this will not just ruin the game, it may ruin any friendships you have. Playing the role of dictator and telling the players what they can and can’t do in the context of real life (which is how they’ll see it) will make them look at you in a different light. It can be stressful, so be diplomatic; even join in a little to help defuse the situation and get the messing about out of their system. This one is simple. All you have to do is ask them, what do they want out of it? If they say enjoyment and adventure then they’ve answered your question and they’ll be more willing to take part in the game for the purposes of adventure. If they say they want as many credits or gadgets as possible then ask them this; what do they intend to do with them after the game is over? What do you remember from the games you enjoyed; was it the fact that you made thousands of credits or was it because you foiled the schemes of the bad guy in a cool and heroic way? Making all that money in the game is good but it’s ultimately false; you can’t spend them when the game is over! The fun from the game is the adventure, not the reward. Getting upset over this will only make the players feel that they are expected to do something for nothing (as strange as that may sound) and they’ll be less willing to take the scenario or campaign to its conclusion. Keep calm and give them their reward, doing it one of two ways. One, you could give them a reward which is the best they could get from the location they are in but, in reality, isn’t much. Or give it to them and then take it all away! That may sound a little drastic, but it could lead into a game where the players try to get it back. You’ll be surprised how strongly they get involved then! This one is simple, too. If the players won’t get involved with an action adventure because they are worried about what will happen to the personality they have nurtured, then ask them, what the hell are you playing this for? Roleplaying games are usually about heroes, action adventure, dramatic melodrama and personal strength. It’s not about skulking out of harm’s way, making sure there’s no danger to the character and basically spending the game fretting about what might happen. Don’t just ball your fists and shout, for God’s sake, do something! Just make sure the players have to do something risky to complete the game. If they don’t, they fail, and to compound the problem those who stood to lose a lot from the game’s failure look them upon with some distaste. This can seriously motivate a player to do the right thing. Getting upset will only communicate to the player that they are not doing what you want them to do and the sense of free will goes out the window and lands in a passing garbage scow. In many respects it has a lot to do with the players and GM’s feelings towards how seriously they want to take the games and just what the individual participants hope to gain. Make sure you take into account everyone’s involvement with what you think is going on. Some of those present will only feel that they are being unjustifiably included in your plots, and, in extreme cases, your frustration. As a last 'Huzzah!' 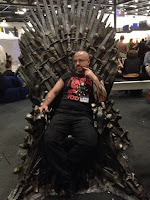 for Farsight Blogger I'd like to welcome to the blog one of my favourite designers, and the custodian of one of my favourite RPGs, Dragon Warriors, resting comfortabley with Serpent King Games. Please welcome to the site Ian Sturrock! 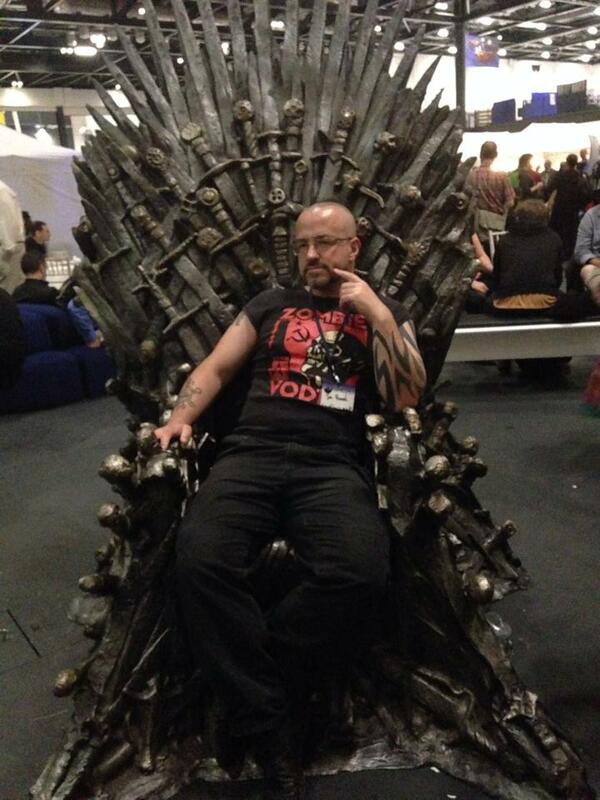 I'm an aging anarchist punk, academic, and geek, not necessarily in that order. I teach game studies and game design at the University of Hertfordshire, which is fulfilling and fun but hard work, and I'm doing a PhD in games and motivation at Glyndwr University. I attempt to find the time to run Serpent King Games, too, but it's almost impossible for me to devote much attention to it till the PhD is in the bag (hopefully early 2017). Tell us about your RPG history - you've got quite a list of achievements, including the Warhammer, Conan and Slaine RPGs. What got you into the wonderful world of tabletop roleplaying, and how did you get to work on such great IPs? Growing up in Britain in the 70s and 80s, I had three main influences that drew me inexorably towards RPGs: Star Wars, Tolkien, and 2000AD. I think it was the latter that meant my first choice of game, in 1982, was the boxed set of TSR's Gamma World. I'd been going in to the Games of Liverpool shop (then a major distributor and importer of hobby games in the UK, soon to be eclipsed by Games Workshop) for a year or so, but patiently waited till my 12th birthday before picking up the "12 and up" Gamma World. The staff tried to persuade me to look at Traveller or D&D instead, but I read and re-read that back cover, and decided that anything with mutants and rad-wastes was the game for me. You have to bear in mind that as kids of the Cold War, my friends and I had expected annihilation at any time; I can remember conversations with schoolmates in primary school in the late 70s about the Three Minute Warning that was supposed to go off once Russian missile launches had been detected, giving us just enough time to get to a shelter (we were pretty sure there weren't any), or, more appealingly, go and punch a hated teacher or something, which was the consensus as to what we would actually do. Then we realised there were probably no warning klaxons in the school, so we figured the first we would know of our impending destruction would be a brief bright flash in the sky, an instant before we were vaporised. Anyway... I read that book cover to cover, and ran a game or two for my sister and some schoolmates, but found that once I started running D&D / AD&D, I had more interest from people. Soon I was playing those ridiculous teenage D&D games everyone plays -- 26th level Anti-Paladins and maxed-out evil Elf Fighter/Magic-Users and so forth. We all devoured and swapped the Fighting Fantasy Gamebooks in school lunchtimes too. It was a natural progression from those, and D&D, and reading White Dwarf, to Dragon Warriors. I wrote a pretty long blog post about that here, so I will try to avoid repetition and just link to it. My lucky break to actually get working in the RPG business came by being a relatively early (late 90s) adopter of the internet. I managed to impress James Wallis, then running Hogshead Publishing, sufficiently that he gave me a part-time job in the company's tiny Clapham office. I very much enjoyed working for James, and it's testament to how fantastic a person he is that we remain good friends and occasional collaborators fifteen years on. We most recently worked together on a chapter on Games Workshop and Warhammer 40,000, as part of an edited academic collection on wargaming, Zones of Control (MIT Press, 2016). Via the Hogshead job, I made contact with Mongoose Publishing, then no more than an idea in the minds of the very young-looking Matthew Sprange and Alex Fennell, for a book called Slayer's Guide to Hobgoblins. A few months later they were expanding and looking for writers. I submitted the Slayer's Guide to Medusas as a writing project, and they liked it sufficiently well not just to publish it, but to give me a full-time writing and game design job. Mongoose was expanding rapidly at the time, and I guess due to my lifelong love of Slaine -- the day that first story came out in 2000AD in the 80s, I read it and immediately got to work on a "Celtic Warrior" character class for my AD&D campaign -- I ended up as "the guy who does the barbarian games." Which got me the chance to write Slaine, and then Conan. Working with Mongoose was a bit of a mixed blessing. The workload was immense, with an expectation that we could write a bare minimum of 80 to 120,000 words of publishable RPG material per month -- including doing any playtesting, and squeezing in convention demos, the odd editing task, etc. Pretty much every writer I knew in that position burned out after a year or two, me included. On the upside, it meant I got a load of work out there with my name on it, and it was good enough that I won several awards for it over that first year. For me, the characters seem to come alive more than just about any other medium. I love larp, and videogames, and I enjoy watching plays and films, and reading books. All those media can have memorable, rounded characters, but there's something about tabletop RPG that, for me at least, makes the characters more real. I'd love to do some theorising about what the mysterious factor is, that's somehow different. But it's there. It's tough to pick one favourite, but I think I'd go with Amber Diceless. I love the Amber books. The game, though it doesn't quite capture the details perfectly, does capture the sorcery-enhanced, duelling, assassinating, family realpolitik of them. With the right group, you can run a game with 8 or 10 players, that ranges from intrigue-laden banquets to world-shattering battles to relaxed time spent at home in one's private dimension. The players don't get bogged down in stats and suchlike, because after an adventure or two, they don't quite know what their stats are any more. The most recent release that got me really excited was Hillfolk/Dramasystem, a couple of years back. I ran some Iain M. Banks-inspired games at Worldcon 2014 using it, because his Culture novels seem to focus on character interactions so much despite the space opera setting, so it seemed a natural fit. Inevitably I keep coming back to Dragon Warriors too. I ran a short campaign of the original adventures for some work colleagues last year. Very occasionally! I ran a game of The Princes' Kingdom recently for my partner and her two kids, and played in a Star Wars game run by another friend earlier this year, but I don't have a regular gaming group right now. I have a few interested friends, though, and I plan to run some Dramasystem games over summer for them. It will do fine, as a hobby. There will always be a few people who loved the dungeon-bash aspects of D&D more than the roleplaying aspects, and those people will find their gaming needs served better in videogames, or the better dungeon-bash boardgames, than in TTRPGs. People who love both will still enjoy Dragon Warriors or D&D or similar. Then, partly through the maturation of the hobby, and the recognition of it as an art form, and partly through the massive expansion of genres and systems away from those old school approaches, more people will try it out -- people with a background in traditional art or drama, or newer geek interests like cosplay and anime, rather than wargames and comics. That's not, incidentally, a suggestion that art and drama are superior to wargames and comics. Check out Junot Diaz's podcast for MIT's Comparative Media Program for an insight into why, in some ways, geeky art forms are better at answering the big questions of the 20th and 21st centuries than more traditional art forms. 1) The aforementioned indie games, which gave designers permission to get rid of complex systems (something Dragon Warriors did in the 80s, admittedly!) and really focus in on the core activity of the game or genre. 2) Changes in gamer demographics, so that there are now a load of teenage players plus their parents' generation doing a lot of the TTRPG gaming. Neither of those groups, for the most part, wants to spend hours hundreds of hours mastering complex game systems, particularly if they're only playing rather than GMing. The teenagers are used to computer games, which they learn by playing, not by reading the manuals (not that there even are any manuals). Middle-aged players don't have as much time to do system mastery or preparation as they did as teens or students. So for both groups, you want super-simple character generation -- no more spending a full 3-hour session just figuring out a bunch of numbers. Let people pick an archetype, hand them a character sheet (or better, a card) with their core stats on, and get them playing. 3) The market has fragmented again, after a brief convergence on d20. That means there's not so many fortunes to be made in the industry. You can still pay the mortgage or the rent if you work hard, hit deadlines, get on with people, and produce high quality work, but a large number of publishers and writers in the industry will be treating their work somewhere between a low-paid part-time job and an occasionally paid hobby. The boundary between fan and professional is as blurred as it ever was, and that's really not such a bad thing. One of the biggest strengths of the hobby has always been fan creation and fan labour. There are some incredibly talented fans and semi-professionals out there, doing amazing work. I'm one of them, these days, because my day job pays the rent. I have to pick one?!? I'm a very proud kind of person, you know! I think right now, it's probably the academic analysis of romance in tabletop roleplaying games, with a particular focus on Pendragon, which is a chapter in the Game Love Reader from Routledge, edited by Enevold and MacCallum-Stewart. I'm not wholly satisfied with any of my d20 games, because they were all sufficiently constrained by the system and by publisher expectations. I mean, Slaine and Conan are both great d20 games, and I'm very proud of how well I tweaked d20 to directly reflect the source material. In the UK, I keep getting people telling me how much they still love Slaine, especially, and that absolutely makes me proud. But, I can remember picking up Ron Edwards's _Sorcerer and Sword_ as research when I was writing the Conan game, and wishing I had the freedom to junk some of the d20 legacy stuff and make something simple and action-focused. And I love all the work I did (originally for James Wallis's Magnum Opus Press) for the Dragon Warriors relaunch, because DW is still my favourite TTRPG for bashing dungeons and a bit more. But I'd love to do a proper 2nd edition (Huzzah! - Jon), that retains the simplicity of the original but offers a bit more player choice. It's just a bit dull that most combats boil down to "stand there and roll to hit, roll for armour penetration, repeat". I'd love a combat system more like that of the lovely, streamlined, fluid, yet tactical and choice-heavy. The One Ring. And for a lot of the things like wilderness travel, environmental hazards, traps, exploration, etc., it would be great to incorporate the kind of ideas that Ken Hite and Robin Laws riff on in their KARTAS podcast, so that again the focus is on choice and storytelling rather than a series of random rolls. So again, DW falls slightly short of perfection in my eyes, largely due to the core system being 30 years old. We've seen a lot of new ideas in game design over that time. I'm seriously proud of the rejig of the Prince of Darkness campaign, though, for the relaunch. Mostly my PhD, and teaching, and research. You can find out a bit more about my research here, and the teaching I do is all on the world-renowned Animation course at University of Hertfordshire, which I can recommend to anyone wanting to learn games art, animation, concept art, or VFX. Someday I will get together with the other Serpent King people and make that Dragon Warriors 2nd edition, but it's a big job and we'd be keen to ensure all the 1st edition material remained compatible. When writing a scenario, or any kind of literature for that matter, the author must take several things into consideration. First, the style of the game must be established, meaning that the atmosphere must be created for the game effectively. If the game is energetic and fast the action and style of writing must reflect the speed and urgency of the situation. Alternatively, if the game is to be slow, mysterious and dark, then attempts must be made to keep the atmosphere smooth and detailed so that the players can absorb the story and characters. To maintain the atmosphere during writing, and to keep the style consistent, it is best to keep you surroundings similar every time you sit down to write. Keep an ambient soundtrack playing softly in the background with a melody that will reflect the game. If your writing a fast paced game then play the high-energy tracks, keep up the adrenalin with the thought of the action you are trying to emulate. If your writing something a little more sombre, keep the tone low and brooding and, in both cases, try to imagine how the players will react to the designs and situations you are creating. Secondly, figure out what kind of game the players are used to playing. 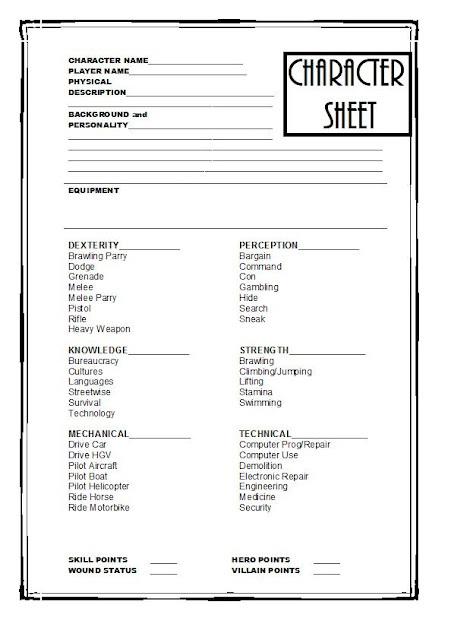 Also think about each of the Player Character’s (PC’s) aims and styles of character. Try and give a little of something for each player to do to spread out the involvement of each of the friends at the table and try to avoid creating a scenario that really only applies to a portion of the players. If all the players are used to high-energy games then create an original story but with the required amount of guns and action. The flipside of this is to turn the desired story up on its head; the players are big action heroes, so turn down the heat and get serious. Switch the explosions and blaster fire for dark corridors and flashlights, something a little more investigative. Many players will respond eagerly to a complete change of style of play and then be more willing to explore aspects of the game. If they don’t go for it, that’s fine. At least you’ve used that night’s gaming as a test bed to see if you can introduce a new flavour into the mould. It’s advisable to introduce these new ideas every few sessions; if you test new ideas every week and the players don’t respond positively then they might not come back for more. The plot is the biggest thing of all. It is the flow and content of the story the players will remember. If all they remember is how they took down the enemy, blew up armies and defeated the bad guys then they would be more suited to playing a wargame, not a roleplaying game. Roleplaying should have defining moments, including the conflict, but a lot of those moments should be defined by high levels of drama, the melodramatic stuff that most people have come to expect from films such as Star Wars. When Luke was hanging off that pylon in The Empire Strikes Back, and Darth Vader said ‘I am your father’, it was one of the most memorable moments in cinematic history. There was no need for blasters or starships exploding or any kind of physical conflict (fair enough, they had been knocking each other about in a lightsabre duel), but the moment, that defining moment, was what took people aback. You remember the sheer sense of wonder at the flying energy bolts and the ships tearing through the asteroid field, but that sense of drama, of horror, at the revelation of the relationship is the best part. If the players kill enough dark magic nasties or uncover super-weapon plots on a regular basis they’ll get bored. If you make the games memorable with the situation you put the players in and the problems with the dangers and characters they come across the players will be a lot more interested to see ‘what happens next’. This is what makes soap operas (even dodgy ones) successful. It has been said that there are only nine basic plots for all genres of story to cover. Romance, murder mysteries etc. This is a bit of a pain. How can you make the story original if you’ve already exhausted a hundred storylines with different modus operandi? Well, the key thing to remember is that its not generally the reason behind the story that drives an adventure’s plot - it is the route the players or the unfolding events will take that make the game memorable. As long as the players get to do something different every week they should keep attending your games. They won’t care that there was another murder in this week’s game, but they will care how the murder took place and for what reasons. Be careful, though, not to try and re-hash old ideas and make them bigger and better than before. The players will know straight away that you are trying to recapture the highs of a past game and won’t respond to it as well. It is originality that keeps the players at your table. How long do you intend the game to last for? This depends on whether you want to run a campaign or single- to two-night sessions. When writing a long campaign it is always best to design a basic situation, with a rough sequence of events and the lists of goals and non-player characters (NPC’s) to pace out the story. That way, when the players finish the game for the night you can make a few notes about what they did and accomplished and have it affect the sequences of the next game. If you just play out the game week by week to a set curriculum that you have designed to turn into a long campaign then the players will not only get bored with having their PC’s led around by the nose they will also be less willing to turn up for the next game if they think the same thing will happen again. That makes the hard work you have put into the campaign design worthless, especially if the players give up on you. The golden rule is that the game is for the players, not the pages and pages of linear material you slaved over for this very reason. A lot of GM’s are concerned about how much detail they should put into a game design. Should they list every possible outcome of the story? Should every nuance and capability of the NPC’s be listed in detail? The truth is, it doesn’t matter how much detail you put into a design, as long as you are comfortable with it. If you need all that information then go ahead and get it all down on paper. If you think you can do without it and that all the information you haven’t put down is easily winged, then go ahead and wing it. A lot of the time it will depend on how experienced the GM is. As long as the GM is comfortable with the material he or she has in front of them then they will run a relaxed game, which in turn will make the players feel more comfortable. It’s amazing how pressures on the GM are communicated to the players. The GM is the narrator and their feelings are transmitted with their narrative. Designing a fresh and imaginative game for keen players is not an easy task if you’re new to the hobby, but it gets easier with practice and exposure to the game and to the players. After a while, new GM’s will get the feedback from players that will make their games more suited to the group’s needs. There are some experienced GM’s who still enjoy working out every fine detail of an upcoming campaign, and there are those who just write a very brief synopses of the story and take it from there, embellishing the game as it progresses. If you’re comfortable with it, do it. But don’t forget to take the above details under a little advisement; after all, everyone who sits around that gaming table wants something from the roleplaying experience and it is up to you to provide it. This won't make too much of a difference to the world at large but I do get the odd email every now and then about content or review material for Farsight Blogger so I thought I'd just put this out in the open. I've been doing this blog since June 19th 2009 and I've had a great time with it. I originally started writing articles, doing reviews and creating stories for a Star Wars fansite called Lightsabre (now www.jedinews.co.uk), and after a while I had a go at a small e-zine called ODDS, which I edited for nine issues and enjoyed very much. It was only natural that I created a blog and, after seven years, I've decided to take a deep breath and let Farsight Blogger go... of a sorts. I've been gaming a lot recently and not for any other reason than I enjoy to game with friends. I've not been analysing a system, or seeing how it works for me and my group, or examining the setting. I've simply played the game and had a hell of a lot of fun, and I realised that I spend so much time writing about games that I'd drifted away from simply enjoying them. This rush of creativity has stimulated several other areas of my brain and I also realise that I miss other things - writing for the joy of writing, creating stories and simply working on my own projects. I feel the need to write again, to create and get my jumbled thoughts on paper, and maybe even look to getting some more work in print. It's been eleven years since I was published by the British Science Fiction Association, and ten since I wrote that Battlestar Galactica computer game. I need to flex my mind again and to allow my brain the freedom to do that something else has to go, and that something else is Farsight Blogger. I'm not blaming the blog for my lack of creativity - far from it. This blog has opened so many doors and given me so many avenues to walk down that I've experienced a whole new arena of gaming. I've reviewed amazing games and books, I've interviewed some of the tabletop industry greats, I've met all kinds of wonderful people and I've made plenty of amazing new friends. This blog has done wonders for me and my hobby, and I've gathered so many experience points that I should be levelling up several times over. Thanks to everyone who has been involved. The blog won't completely die; there'll still be my monthly 'Hints and Tips' articles that have been queued up and will last for a couple of years yet. I'll also be carrying on with the interviews as I do love to hear from those-in-the-know and I enjoy sharing their thoughts and views. In fact, if you're in the industry then drop me a line - not only do the interviews appear on Farsight Blogger they'll also appear on WWW.RPG.NET for the whole world to see. I've had a great time with this blog, and I still will in an incredibly reduced sense. As much as we all like talking about our love of gaming on the internet, I've realised that, for me, the best way to share that love is to actually play some games! Cheers, all. 'Tis been a blast! Here's another D6 sheet I made a draft of - I wanted to do a generic action-adventure sci-fi game and use the Star Wars rules, but knew that if I just used the Star Wars character sheet the players might get distracted and we'd end up just doing Star Wars. I figured I could use this for pulp action sci-fi, with rocketships and Martians, as well as for more gritty or militaristic sci-fi adventures. I've been having some amazing fun recently with Call of Cthulhu - the Friday night campaign we have on the go at the Lunar Games Society in Lichfield is going at full steam and, as the GM, I'm doing all I can to keep the story moving while at the same time making sure that the players are having fun. As this is a new group and this is our first campaign together, there's also a large part of me trying to impress them all with what I've learned over my many years of gaming. Hopefully they're having as much fun as I am. I'm a massive fan of the Call of Cthulhu RPG - we're using 4th Edition right now - but there's always going to be a little voice in my head pushing for adventure and pulp-action excitement. I try to reign myself in when I hear the Indiana Jones march raging in my head, and as much as I'd love to have the group get into running gun battles or punch Nazis in the face, I've got to try and keep it in the reality of the setting. It's not just that - the rules of Call of Cthulhu don't lend themselves well to cinematic action. So, I've gone back to the games system that I know will serve me well; the D6 System. The one I use is from the first edition Star Wars RPG rules; it's fast, intuitive and easy to run. As well as being player friendly it's simple enough to grasp quickly yet detailed enough to create some properly fleshed-out characters. I ran a successful Star Wars campaign with it from 1987 to 1996, so that's a win in my book. 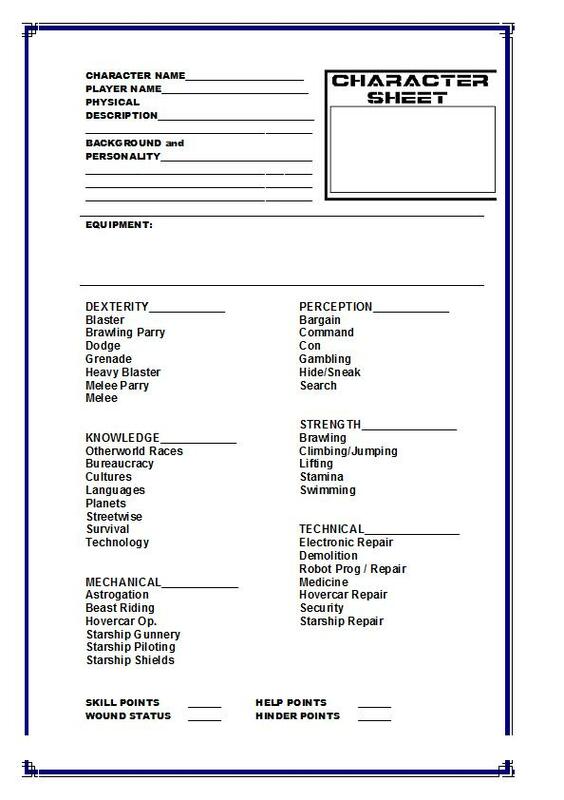 So, I've knocked up a basic character sheet, I'm going to flesh out the background a bit more and I'm going to suggest that the players play as fortune seekers - mercenary treasure hunters who fall foul of organisations both official and unofficial in their search for that big score. Mix some modern-day dungeon bashing with some grudging heroics and I think we've got ourselves a campaign. The game Frostgrave: Fantasy Wargames in the Frozen City is one of my favourite games. I'm not a huge tabletop wargamer - in fact, I haven't played a wargame for a long time, as RPGs are my bag - but this is one of the very few wargames that I've played that has left a lasting impression on me. First of all, it's just so accessible. It's quick and easy to learn, you don't need hours to play it and with just ten figures per side you can set up a warband and be ready to go with very little expenditure. If you've already got a bunch of 28mm fantasy or medieval miniatures from other games then you're pretty much ready to go. Small groups means a lot less time collecting and painting, and just getting on with the game. "Long ago, the great city of Felstad sat at the centre of a magical empire. Its towering spires, labyrinthine catacombs and immense libraries were the wonder of the age, and potions, scrolls and mystical items of all descriptions poured from its workshops. Then, one cataclysmic night, a mistake was made. In some lofty tower or dark chamber, a foolish wizard unleashed a magic too powerful to control. A storm rose up, an epic blizzard that swallowed the city whole, burying it deep and leaving the empire as nothing more than a vast, frozen wasteland. The empire shattered, and the magic of the world faded. As the centuries came and went, Felstad passed from history to legend and on into myth. Only a few wizards, clinging to the last remnants of magical knowledge, still believed that the lost city had ever actually existed. But their faith was rewarded. After a thousand years, the fell winter has passed. The snows have receded, and Felstad has been uncovered. Its buildings lie in ruins, overrun by undead creatures and magical constructs, the legacy of the empire's experiments. It is an evil, dangerous place. To the few hardy souls who inhabit the nearby villages, the city has acquired a new name, ‘Frostgrave', and it is shunned by all right-thinking people. For those who seek power and riches, however, it is an unparalleled opportunity, a deadly maze concealing secrets of knowledge long forgotten..."
How awesome is that? How is that not screaming out for some incredible dungeon-delving, ruin-searching, crazy madcap magical gonzo insane exploration escapades? The actual Frostgrave game and system can be easily converted into a quick and easy RPG, so that you can game your way through the city and still have those wargame sessions you love so much. I added a basic skill roll, which is simply roll 1D20 and beat a target number; easy 5, average 10, difficult 15, impossible 20. That's it - instant roleplaying game. The enigmatic setting is also open to interpretation, as the author Joseph A. McCullough has purposefully left the setting and history vague. This means you can add all kinds of monsters, races and personalities and just go crazy with the city. High fantasy bad-guy blasting? No worries. Gritty medieval dungeon grinding? Take your best shot. Frostgrave welcomes all kinds of approaches, and there's almost nothing you can't do - the Frostgrave Facebook page is proof of that. This a great game and a great place to adventure, and even though the wargame gives you a chance to create some real personalities and get attached to the magician you've created, it really deserves a dedicated roleplaying game to really get into the meat of the setting. So, that's £65.48 to not only get started in the game, but stay involved for a very long time without having to make constant purchases. Of course, the cracking thing is that I've already got 28mm miniatures, dice and a tape measure, so even to dabble in the game will only cost me the rulebook. Other than the game and setting, I really see the appeal of this! How to make your bad guys more realistic. The difficult question is how can the players find out about the past of the bad guy? Unless they knew the nasty before they went bad, which can be a brilliant plot hook, the players don't have many chances to get to know them, what with dodging their blasters and bombs. PC's turning bad is a great idea, and roleplaying games are brilliant for this. If or when a player character turns to evil, the character sheet can be handed over to the GM and then played as an evil NPC. Isn't that a great idea? The character that the players have been adventuring with and getting to know over the past few sessions is now one of the opposite side, adding a fresh new perspective to the game. Maybe the story will follow the same lines as the Star Wars movie Return Of The Jedi, with the PC's trying to convert the evil NPC back to the good side. Talk about high drama. If the players really take to the story well, then the roleplaying opportunities are enormous. This need not only apply to that particular genre. Lets say a player has gotten tired of playing a particular PC, and wishes to retire them or have them killed in a glorious end battle. Why get rid of the character when they can suit a better purpose as an NPC, an evil one at that? This way, the personality of the character has already been defined by the player who controlled it, and if the referee plays that character with the same traits, but with a little more hint of nastiness, the players will respond in a much more eager manner than if they were up against another NPC nasty. Alternatively, and easier to pull off, the bad guy can be an old friend of the PC's, an NPC who turned nasty, as simple as that. A good plot twist is to have the NPC act like a really good friend to the characters for many sessions, and then the final twist is to find that the NPC is the chief behind all the problems the PC's have been investigating, and didn't want to directly hurt the PC's because he really did get on with them. Nice twist, huh? Bad guys, or at least the characters on the opposite side, can suddenly take to new depths with this kind of personality input. Why should the chief protagonist be evil? It's pretty much assumed that any NPC who tries to thwart the ultimate goal of the PC's is a nasty. It need not be that way. The NPC who is trying to stop the PC's from finding the sacred diamonds of Lutz, for example, may be doing so out of a religious or belief-driven motivation. Look at the Brotherhood of the Cruciform Sword in the film Indiana Jones and the Last Crusade. That group attacked the heroes straight away, and you immediately think that they are on the wrong side, but it turns out that all they are trying to do is protect the secret of the Holy Grail. Fair enough. They think they're doing the right thing, and maybe they are, but all it was, was a difference of opinion on what the goal of the story meant to each participant. Maybe you could generate that kind of opposition between the player characters. One could be out for the money, another for the glory, and yet another could be thinking 'maybe we should leave these diamonds of Lutz where they are'. It's quite simple to have that escalate into heavy in-party rivalries, but this should be stopped if it seems to be going too far. The main reason why a group plays together is to co-operate and perform as a team, anyway. Unless you’re paranoid. The bad guy could even take the form of an animal. Yes, it can be done, and if it goes according to plan it can be quite effective. If it doesn't go as well as expected, then it could turn into a cheap re-hash of the Alien movies. What am I talking about? Well, lets take Ridley Scott’s movie Alien as an example. The film was about an alien life form, which gets on board a spaceship and proceeds to eat the crew, moving and hunting as a predator and running circles around everyone. The creature killed in a nasty way and had a real dark, evil look to it. When it finally gets vaped, everyone cheers and the evil alien is defeated. But, it wasn't necessarily evil. It wasn't necessarily malevolent. It did what came naturally to it, it fed and reproduced. That is the basic requirement of any life form (unless your playing a totally whacked-out game), and, if you want to look at it simply, the alien was doing what it did. But that's not how you would see it if you were on the receiving end. This creature would be doing things that would abhor you, eat things that would make you feel sick, move around and kill in a fashion that would scare the hell out of you. Basically, you would think that what the creature was doing was evil. Evil if it was human, maybe, but we can't judge other life forms by our own standards, be they ones from outer space or ones we share our planet with. Before I get too heavy, I'll get to the point of all this. The protagonist of a game could be such a creature. You can get a very entertaining game if you keep the players on their toes wondering what to do next. You see, they can't guess what a creature is going to do like they can guess the next move of an intelligent being, and that is what makes the game entertaining. They are continuously looking over their shoulders and watching each other's backs. It need not be done with an alien. You can get the same effect with a large predatory lizard, and an even more effective way is to have a swarm attack the PC's in the form insects or some other lifeform, making defeating them much more difficult. The point is, creatures have no qualms about doing what they do. Where the more intelligent bad guys would observe and calculate, the creature would get stuck in. Simple as that. Well, I think that about wraps it up. I hope that this little piece has given you a few ideas on how to improve what threats the players will face. Remember- if you make notes about what your head bad guy is like, and stick to those traits, then it will make for a more believable NPC. Not only that, when you come to create a new protagonist, you can see what has come before and create an original one to keep the game fresh. Another key thing to remember- don't be too proud of the bad guy you create. Ultimately, they'll be defeated, and after all, you're not in contention with the players. Of course, you don't let the players know that.